Runners participate in the inaugural Tunnel To Towers 5K Run. Tunnel to Towers Run Savannah, presented by Wells Fargo Advisors, recently opened registration for its second annual 5K run/walk, which will feature a special memorial tribute in memory of New York City firefighter Stephen Siller and 342 FDNY brothers who sacrificed their lives on September 11, 2001. Public service industry workers, corporate teams and the public are encouraged to register for this patriotic event. Challenge. Teams of four firefighters or more from across the nation are expected in Savannah to compete in this year’s race. The winning team will take home a traveling trophy and have the opportunity to defend their title in 2014. All proceeds from the Tunnel to Towers Run Savannah will go directly to “Building for America’s Bravest” through the Stephen Siller Tunnel to Towers Foundation. These funds will be designated specifically to building “Smart Homes” for two severely wounded veterans in Georgia: SFC Mike Schlitz, U.S. Army, in Columbus, Ga., and Cpl. Todd Love, U.S. Marine Corps, in Atlanta. A special $25 registration discount is available for military, firefighters and police officers. In addition, a special discount will also be offered to The Siller Cup firefighter teams. For more information about T2T or The Siller Cup, please visit www.t2trun.org/savannah or call 912.313.4806. The run will be held on Saturday, September 14, 2013 starting at 8 a.m. It will begin at Orleans Square at Barnard Street (between Hull and Perry Streets). Register in advance online at www.t2trun.org/savannah or in person at Fleet Feet Sports, located at 3405 Waters Avenue in Savannah. 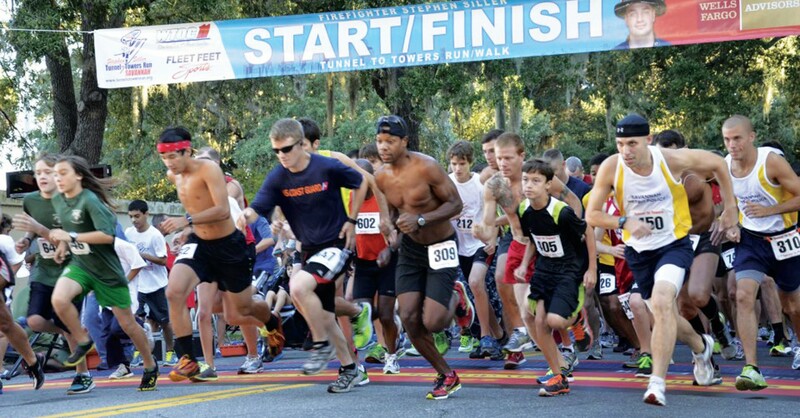 Participants may also mail the registration form to Tunnel to Towers Run Savannah, P.O. Box 335, Pooler, Ga. 31322. Entry into the run is only $25 through July 6, $30 through September 12, and $40 after September 13 until race day (September 14).